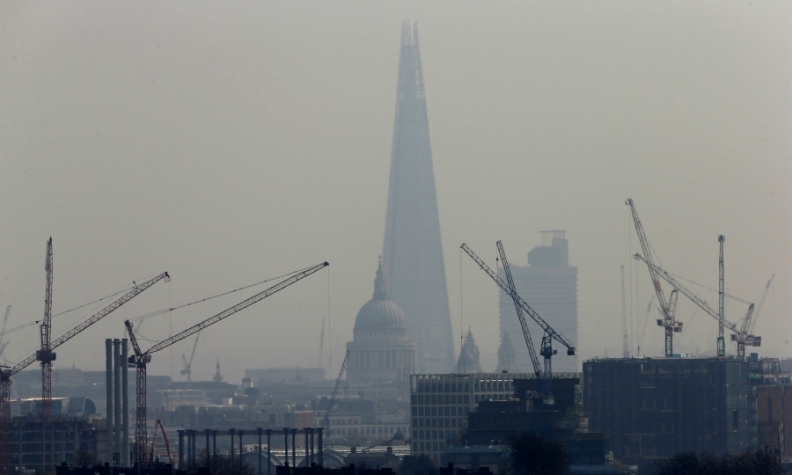 London breached its annual air quality limits by the end of January. LONDON -- The UK government must bring forward a 2040 deadline to end the sale of gasoline and diesel cars as the country faces a national health emergency over illegal levels of pollution that cause about 40,000 early deaths a year, a group of lawmakers said. Among a raft of suggested measures, politicians also want automakers to pay into a clean air fund that follows a "polluter pays" principle. A 220 million pound ($307 million) clean air fund has already been announced by the government, although it excludes London. Electric cars will outsell fossil-fuel powered vehicles within two decades as battery prices plunge, and by 2040 almost 80 percent of new-car sales in the UK will be electric, according to research from Bloomberg New Energy Finance. "The UK automotive industry is investing billions in technology and other measures to help address the challenge," said Mike Hawes, CEO of the Society of Motor Manufacturers and Traders. "Vehicle manufacturers are funding scrappage schemes themselves to get the older vehicles off the road. Other sectors must also play their part in improving air quality." The Conservative government is more concerned with box-ticking and compliance exercises than in developing a clean-air plan that tackles public health concerns, which cost the UK taxpayer 20 billion pounds a year, four separate parliamentary committees said in the report published Thursday. "The government's latest plan does not present an effective response to the scale of the air quality catastrophe in the UK," Conservative lawmaker Neil Parish and chair of the Food and Rural Affairs Committee said. The government has consistently been called out by British and European judges, as well as the United Nations, for repeatedly breaking domestic and international law on acceptable pollution levels. London breached its annual air quality limits by the end of January even under government policies aimed at reducing reliance on oil and coal as well penalties against the most polluting diesel vehicles.